As China adds finishing touches to many of its man-made islands in the South China Sea, the Obama Administration is mulling over sending a major U.S. Navy surface combatant within those islands’ claimed territorial waters. This follows President Xi Jinping’s formal visit to the White House, where many issues were raised and some resolved, although China’s territorial claims in the South China Sea appears not to have been one of them. This issue has been simmering for years, with nobody in Washington seemingly interested in really confronting it until fairly recently. This is unfortunate as China’s man-made islands could soon be heavily armed with fighter and maritime patrol aircraft, anti-ship missiles, surface-to-air missiles and a whole slew of sensor capabilities. As a whole, such an entrenched position could allow China to deny access to large portions of the South China Sea, importantly one of the world’s major shipping lanes, to anyone they wish. They could also end up solely controlling large potential energy reserves and fishing resources. China has taken an increasingly harsher stance against other countries that also have claims to portions of the South China Sea, including Brunei, the Philippines, Vietnam, Taiwan and Malaysia. They are also quickly building a long-range “coast guard” with Navy type capabilities that will enforce their extra-territorial claims with considerable might. U.S. observation flights near China’s islands have also been a point of contention between the two countries, as China has repeatedly warned off surveillance aircraft operating in international airspace. Additionally, there have been reports that China has attempted to jam USAF RQ-4 Global Hawks spy drones operating in the area. Now it seems as if the Pentagon and the White House are racing to figure out what to do about the increasingly volatile situation. Apparently, the most popular option includes sending a U.S. Navy surface combatant to sail closely around the islands. Direct overflights or navigation within the 12 mile territorial zone surrounding China’s man-made islands have not occurred since 2012, when China’s island-building projects were far from complete. If the Obama Administration approves the plan soon, the ship that will execute it will likely be the USS Lassen (DDG-82), an Areligh Burke class destroyer that has been operating in the area for months. Another option would be to send a largely defenseless Littoral Combat Ship based in Singapore to execute the mission. Sending an LCS instead of a destroyer would send a softer message to China and the ship’s shallow draft and high-speed would lower some of the mission’s inherent risk. 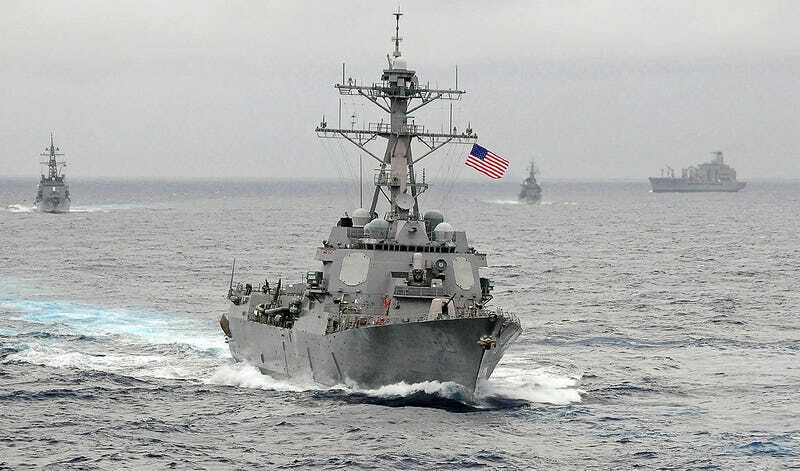 The idea is for the U.S. Navy to exercise its freedom of navigation in the area in order to a set a precedent with China that they cannot simply switch off international maritime law at will. In fact, even if the U.S. recognized China’s man-made islands and their territorial claims, they could still pass within 12 miles of their shores under the right of innocent passage, something the Chinese just executed in Alaska’s Aleutian Islands for the very first time. An act that came and went without American protest. “The United States is a global power and it has a global Navy... and it should not be a surprise to anybody that we will exercise freedom of navigation through wherever international law will allow. Although the CNO’s statement is accurate, there is clearly more weighing on such an operation than just exercising international navigational rights. The Chinese have been extremely sensitive when it comes to American and other ships and aircraft approaching their man-made islands. Having a U.S. destroyer cruise within these islands’ claimed territorial waters would be viewed by China as a massive escalation in power projection by the US. In the past, China has warned against such an action and Chinese media has called for a firm response if something of this nature were to occur. What China could do to push back against a U.S. Navy patrol around their manufactured Islands, without actually firing on a U.S. Navy ship? They could use their fishing boats to block the ship’s path and harass it. They could also lock the ship up with various weapons system’s fire control radars while they transit the area, and they could closely shadow the U.S. Navy ship with their imposing Coast Guard vessels, issuing a continuous wave of warnings. Regardless of what tactics China may apply, if the order is given and a U.S. Navy vessel pushes into their claimed territorial waters in the South China Sea, it will be a tense affair to say the least. As for a coalition to help send a clear message to China, it does not appear one is coalescing. As of now the Philippines have outright supported the plan but are not going to send vessels themselves and the Australians don’t seem too interested in sailing their own ships into the volatile zone either. It is now a waiting game to see if the White House executes the plan, the results of which could run from routine to dangerously spectacular.